My last run with the Bangalore HASH was the run 412, I missed 30runs!! With the shoe clinic by Doc (Dr. Rajat Chauhan) in the morning and the clash of the titans at Roland Garros inviting me to the idiot box, it was quite an effort to get my bum on the saddle. 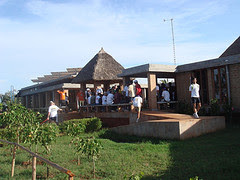 Our Native Village: The run was at this place called ‘Our Native Village’, arguably India’s only eco friendly resort. Set in the middle of fields near Hessarghatta, there is evidence that it probably is. I was told that the electricity was generated by solar panels, Gobhar gas and a chotu windmill and a natural swimming pool which uses aquatic plants for water purification. 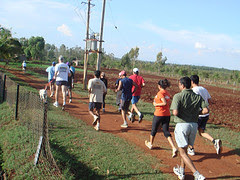 The place is run by a very enthusiastic CB (Sibi) who is himself a passionate runner. There are two routes to the place. You have to take a right turn at the Hessarghatta cross on Tumkur road and drive up to Hessarghatta. The other one passes through Jalahalli Air Force Station and lot of villages on a very winding route to Hessarghatta. You need to take a right turn at Hessarghatta on the route to Taj Kuteeram. About half a km before the final right turn to Kuteeram, take right into a dirt road. 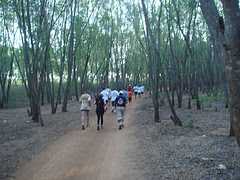 Continue on this “Road to the Sky” for 1.5kms, take right at the T-junction and follow the road to the windmill and the ONV resort. Road to the Sky: While the entire ride was good, I can’t forget the last leg. As you get into the dirt road, the shrubs have given way to the grasslands. The grass was lush green with remnants of a downpour in some places. A gradual incline to the road created an illusion that the road actually went nowhere. The green of the grass only met the blue of the clear sky all along the panoramic horizon, except where the road went. As I rode into the sky, savoring every bit, the view panned out revealing a single row of trees, drawing a boundary to the splendid view. The road ended at those trees. The run itself was fantastic, with over 40 hashers including some very beautiful ladies. There were loads of false trails, a few long ones, I took at least 6 of them. Like always, there were lots of unbelievable imagery of the Hessarghatta countryside. The only sore point was the heat, far hotter than usual. A couple of forerunners confirmed a distance of about 16kms. The virgins (3 batches of them) got iced, a adieu to French fingers, the Abnash’s new shoes ceremony and three generation hashers on ice, were the highlights at the circle. This one, coming a week after the KFD, Hennur road run has really put my running back on track. The photographs are courtesy Abnash. For the entire lot check his photoset here.